Grab some good grub at the Fieldhouse Pub! As you may know I am constantly doing my research to find the best places with great deals. I ended up finding my way to the Fieldhouse Pub this past Thursday and ended up enjoying a great meal. 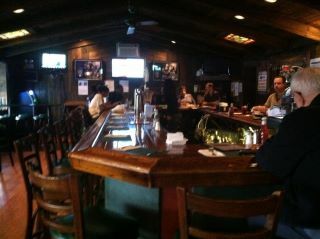 It’s a small hometown pub in Fairfield, great place to go with family and friends. Customer Service: 4.5– I came in when it opened at 11 a.m so it wasn’t very crowded. They answered all my questions and recommended a burger so I got the burger. Since it is a hometown bar the barmaid was discussing stuff with the other server, which turned me off a bit but it made sense with the kind of bar it is. They care a lot about their customers which was good to know. Atmosphere: 5– The atmosphere is of a traditional irish pub. There is a lot of history behind the decorations which I found to be awesome. They also have a dining room and hall downstairs thats used for parties. I really liked it. Food/Drink Quality: 4.7– The malibu bay breeze the barmaid made was delicious and a nice size so it was worth the money, roughly maybe $6. 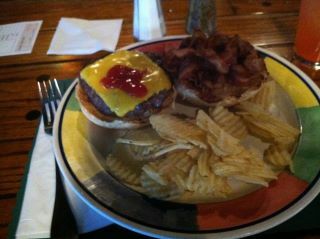 The burger was big & delicious, and I was able to put as little or as much bacon as I chose. I even had some of the burger leftover. It came with potato chips, fries cost extra. Price– $-$$: Since I came for lunch, the burger & drink came to $15.50. Which isn’t too bad for the meal I got. Of course dinner is more expensive but they have daily specials. They have a great variety of drinks and food. I’d definitely want to come back one night for dinner. Final Score: 14.2/15 — I highly recommend to come to the Fieldhouse Pub with friend and/or family. It’s been in Fairfield for years and has many loyal customers. The food and drinks are awesome and they have specials all the time. They also have karaoke on Thursday nights. I’m definitely looking into making a trip back soon!